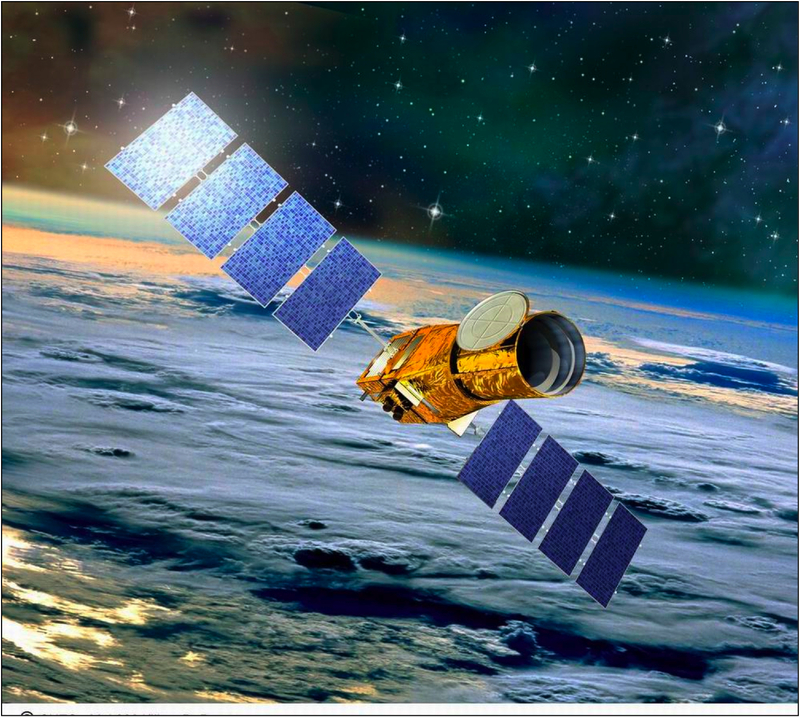 The Convection, Rotation, and Transit (CoRoT) satellite, launched on 27 December 2006 as a CNES/ESA mission that used high-precision photometry to study the pulsations of stars (asteroseismology) and to search for transiting exoplanets around main sequence stars. It was de-orbited in 2014. The NASA Exoplanet Archive partnered with the CoRoT mission and LAEFF to provide access to the public mission data. The NASA Exoplanet Archive provides an interface to search the stellar and light curve properties for both the seismology and exoplanet channels. The archive also provides the ability to visualize the light curves for a given CoRoT target. As part of the search results, the archive creates a wget download script which can be run from the user's computer to download the light curves matching the search criteria. The CoRoT mission light curves are also available from a dedicated FTP server located in France at the CoRoT Mission Data Center at Institute d'Astrophysique Spatiale (IAS). The available public data from the CoRoT mission are the N2 data products (which are the primary scientific data products) as produced by the mission. Details regarding the available data products and IDL tools to read the data into IDL are available at the CoRoT mission archive. Summarized below are some details about the CoRoT mission. More detailed information can be found at the CNES mission page. The CoRoT satellite is in an 896 km altitude polar orbit (inclination = 90°) with an eccentricity of 0.00127 and orbital period of 103 minutes. The telescope was 27 cm in diameter with an external baffle designed to reject scattered light at the level of 10-13. The CoRoT focal plane contains four EEV 13.5-µm thinned, back illuminated CCDs. Two CCDs are dedicated for the exoplanet channel (E1, E2) and two CCDs (A1, A2) are dedicated to the asteroseimology channel. The full field of view is 3.05° x 2.70°. A schematic of the focal plane array is shown in Figure 2. Constrained by the satellite orbit and the need to restrict scattered light from the Earth, the CoRoT satellite is restricted to fields of regard on the sky located near the galactic center and anticenter—often referred to as the "CoRoT eyes." The CoRoT eyes are 10° in diameter and are centered at α=18h50m,δ=0° for the center field and at α=6h50m,δ=0° for the anti-center field. Within the 15.7 square degree fields of regard, the satellite can observe approximately 8 square degrees at one time corresponding to the focal plane arrangement. The satellite spends approximately 6 months per year observing in the center direction and 6 months per year observing in the anti-center direction. A graphic representation of the CoRoT eyes can be found here. The CoRoT mission has divided the observing of these regions to accommodate the seismology and exoplanet programs into runs lasting 20 days (short run) and 150 days (long run). The exception to this was an initial run at the beginning of the mission which lasted 50 days. 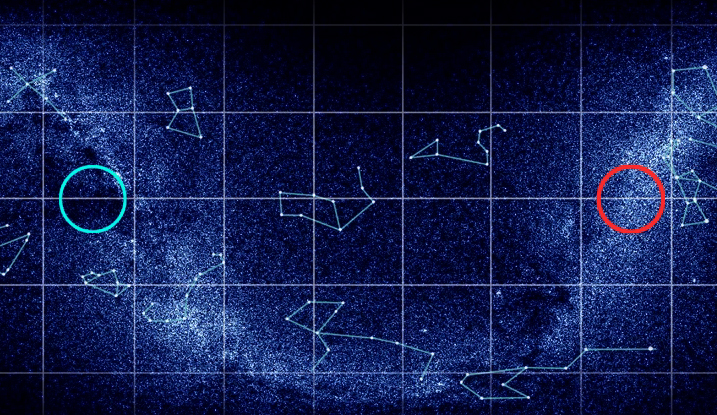 Within each field of regard, there are multiple regions scheduled for observations. The nomenclature for these regions are IR, SR, or LR (for initial, short, or long run) + a or c (for anticenter or center fields) + NN (a 2-digit number). For example, the initial 50 day observing run towards the anti-center is referred to IRa01 and the first long run towards the center is referred to LRc01. There are no photometric filters in the asteroseismology channels. The exoplanet channel has no filter, but there is a low-resolution spectral dispersing prism. The prism is intended to provide "blue," "green," and "red" simultaneous light curves of the exoplanet targets. White light photometric time series are constructed through the addition of the three "colors-channels." 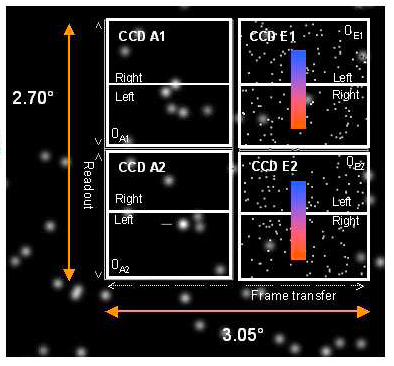 These are not true photometric channels. Figure 1: Artist conception of CoRoT in orbit. Figure 2: Focal planet arrangement of the asteroseismology (A1, A2) and the exoplanet (E1, E2) CCDs. Figure 3: Position of the CoRoT eyes in the sky. The blue/green and red circles represent the center and anti-center. "The CoRoT satellite in flight : description and performance," Auvergne, M.; Bodin, P.; Boisnard, L.; Buey, J. -T; Chaintreuil, S.; CoRoT team 2009 A&A. In the course of processing the CoRoT light curves, the NASA Exoplanet Archive has discovered a very small number of anomalies. The anomalies are known to the CoRoT mission and will be addressed in future data releases by the project. The number of light curves affected is very small and are identified below. Photometric uncertainties are not provided in the CoRoT FITS files for CHR chromatic light curves for the following runs: LRa05, SRa04, SRa05, LRc08, SRc03, LRa04, LRc05, & SRa03. Consequently, a chi-squared statistic cannot be formally computed. A value of 0.00 is recorded in the metadata provided by the NASA Exoplanet Archive.